Your Daily Cute: Two Cats Tuesday: We're Packing! Happy Two Cats Tuesday, Cuteheads! Whew... it's been a busy couple weeks. We're moving (not too far, just a few miles away), so you know that can get crazy. 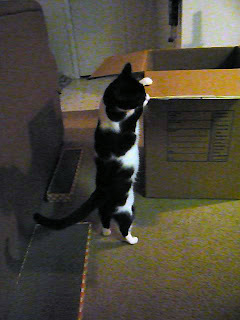 Moo, who as you know as an obsession with boxes, must check out every single one. Then he has to get ON each one, just to check for sturdiness. I guess. And did you know that boxes make pawsome places to take a nap? Good luck, hope Moo keeps his spirits up during the move!! how cute,,good luck to you and your pals! Good luck on your move. 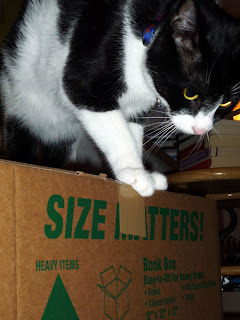 Then Moo can unpack all the boxes. We don't envy you at all. The only good thing about moving is finding everything you had no idea where it has been for years. Have fun packing and good luck on your move. It's always such a lot of work to move but I am sure it will be worth it! I hope Moo and Pimp enjoy their new home. Moving is a pain in the tail so we all understand. Good luck in your new home. Pimp's just jaded - boxes rule! Good luck with the move! With Moo checking the boxes first you should have no problems! We know that moving is tough, and packing is the worst part, so we hope it goes smoothly for you! 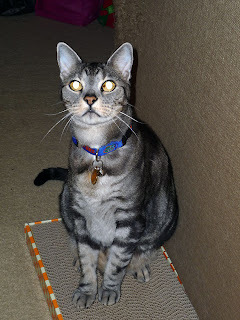 Can Gus come over and play with your boxes? He loves to climb in and out of them. Good luck with your move. Hope everything goes well! Oh that Moo, I've got cow tongue on my blog today! What a good kitteh! Moo's packing! Good luck with the move. He he - I think I just saw myself in one of those boxes. 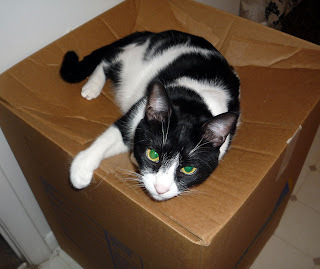 We wish you good luck with your move too & save some boxes for playtime!